← Living The Dream, Do What You Love and Love What You Do. How important are memories? Can you imagine life if we did not have the ability to treasure life’s experiences and learn from our memory? Our life is a collection of memories. The more that we create the richer our lives. Memories don’t have to cost much, but the collection of them provides riches of joy, wisdom in learning from our mistakes, and a well of stories to entertain and share with those we love. As a parent one of our greatest privileges is getting to start our children’s collection of memories. Simply living life together will provide many memories, but we also must be careful in our busy world or routines that life and the memories that make our lives and the lives of our children rich are not lost. Much of our time is spent in providing for the basics necessities such as sleep, eating, grooming, errands and driving. Another big chunk is spent in relatively non-memorable activities at school and work. Life really happens in the chunks of time between the mundane where we experience memorable events in the mundane or plan and create memories with the our classmates, co-workers, family, and friends. I am a big believer in being “intentional” about creating memories. A weekend can flash by with errands and lost time without a trace of a memorable event. If we would stop for just a moment and think how we can make a memory today. Make a memory that can be recalled and treasured forever. I have included many of these intentional events in my blog and grouped them under Camp Applegate. Picking berries in the field behind the house, going on a blow gun snake hunt, building rope swings, selling lemonade to the neighbors, taking our sugar gliders to the mall, climbing a tree at night and calling coyotes, or spotlighting bull frogs at the ditch are all examples of some of the fun intentional memories we have done over the years. This weekend was a rainy cold weekend and the kids were restless. What a great time to think up something out of the norm to create a memory. 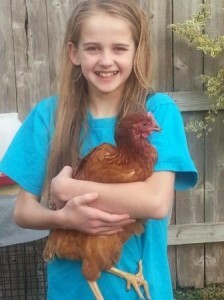 So, off we went to Wabash feed store in downtown Houston where we bought two full-grown Rhode Island Red hens. The kids picked out their hens from a group of 20-30 hens. We bought some feed and a water bottle and were off. Upon returning home we set up an old dog cage, built a nesting box and got them settled in. They are friendly little hens that let the kids hold them. They coo and seem to have a little personality. They are surprisingly clean and I hear will even follow you around once they get to know you. Don’t tell the neighbors. I would guess farm animals are not welcome in our neighborhood. We will try them out for a time and if they don’t work out then they may be an expensive chicken dinner. No matter what happens the $32 spent and a few hours together will create a memory. When our kids are old and grey they will always remember the boring rainy day that Dad decided to take us out and buy a couple of chickens. Be intentional. Use your surroundings. Do something unexpected and build a memory that your family will treasure forever. This entry was posted in Camp Applegate, Family Adventures and tagged family activities, Family adventures, Family leadership, family mission, family outings, family values, family vision. Bookmark the permalink.